Palestinian protesters battled Israeli soldiers on Thursday in Jerusalem, Ramallah, and other places in the West Bank and Gaza Strip, one day after President Trump announced that his administration would recognize Jerusalem as Israel’s capital. The Palestinian Authority called for a general strike in Palestinian cities. In Gaza, the Islamist Hamas movement urged its followers to ignite a third intifada against Israel, as the Washington Post reports. The UN secretary general, the European Union’s top diplomat, and Pope Francis expressed concern about the move, while U.S. allies like Britain, France, Germany, and Italy all declared it a mistake, as the NYT reports. And, from the New York Times, see a history of the distinctly modern conflict over Jerusalem. The House voted to approve a stopgap spending bill on Thursday that would ward off a government shutdown for another two weeks. The bill now heads to the Senate, where it is likely to be cleared before federal funding runs out at midnight Friday, as Politico reports. And, read the transcript from a CSIS press briefing today on the defense budget’s long-term trends. A Western-backed Saudi-led coalition scored its first major gains in Yemen since former president Ali Abdullah Saleh was killed on Monday when local fighters captured an area on the Red Sea coast from Houthi rebels, as Reuters reports. The Pentagon announced that about 2,000 U.S. troops are in Syria fighting the Islamic State, almost four times the total previously disclosed as the Trump administration changes how troop numbers are publicly counted. The best minds in national security dissect some of the worst ideas in our new series. You can read them all on Defense360. (Photo credit: Mark Ralston/Getty Images.) 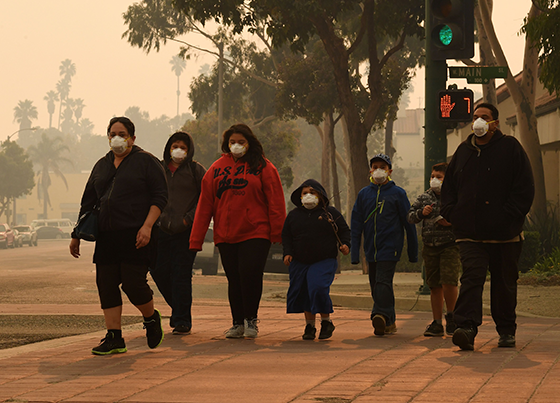 A family wears face masks as they walk through the smoke-filled streets after the Thomas wildfire swept through Ventura, California, on December 6, 2017. Join the CSIS Project on Prosperity and Development at 10:00 a.m. for a panel discussion paying tribute to the legacy of Dr. Janet Ballantyne, a foreign service officer at USAID and a trailblazer for women in the foreign service. At 1:30 p.m., the CSIS Project on Prosperity and Development will host “Demand Driven Development,” a discussion on the role of foreign aid in development finance. Ambassador Carla Hills led the U.S. NAFTA negotiating team in the early 1990s. In the newest episode of 35 West, she reflects on the importance of international trade, the impasse in current NAFTA talks, and damage done to U.S. global leadership. This smile goes out to LA.